[G guardian] (Usable when both fighters' vanguards are grade 3 or greater, and the number of face up G guardians in your G zone is three or less)-Opponent Turn's Guard Step-[Choose a card with "Heal" from your hand, and discard it] Call this card to your (GC) from face down. [AUTO] Generation Break 1:[Choose a face down G guardian from your G zone, and turn it face up] When this unit is placed on (GC), you may pay the cost. If you do, Soul Charge (1), and this unit gets [Shield]+5000 until end of that battle for every five cards in your soul. So much choice. So little room. 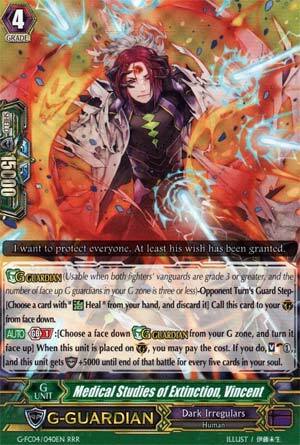 I guess this is the placeholder for a third G-Guardian until the G-BT11 one replaces one of them. CB1, flip a G Guardian when GB1 is online to Soulcharge 1, then gain 5k shield for every 5 cards in the soul. Honestly, I wouldn't have been too fussed about this card either way and just said he was a 1-of tech. Don't get me wrong, he is, but he's actually got a bit more utility than that. With the Heal Trigger meant to support him, he becomes a better Agrat Bat Malat, except with more meat shield for the cost of 1 CB. However, Vincent does suffer a bit from timing issues. This is best dropped when 10k shieldis expected to be generated, because when you're on 15+ soul, you're not supposed to sit and wait to deck out, that's when you win the game. On the other hand, Blade Wings (Sullivan in particular) love this just to speed to the win con a bit more, as their G-Unit can shuffle and refresh a deck. I'll give it a pass as Saint Germain may not have a good board (especially after you board-wiped with G4 Scharhot or something). Use at 1.